Dr. William R. Gillette was raised in Michigan’s Upper Peninsula but now makes his home in Harbor Springs with his wife, Dr. Deb Andreen a veterinarian at Little Traverse Bay Humane Society, his twin daughters and a son. Dr. Gillette came to dentistry naturally, his Dad and two Uncles are dentists plus his Aunt is a hygienist. 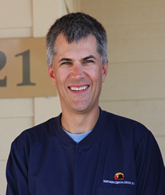 After attending Central Michigan University for his undergraduate work, Dr. Gillette graduated from the University of Michigan School of Dentistry in 1995. He is currently the Chairman of the Downtown Development Authority for the Village of Pellston, where he has practiced dentistry since 1996. Dr. Gillette is also a member of the American Dental Association, Michigan Dental Association and Vacationland Dental Society. He continues to expand his knowledge especially in the area of Implant Dentistry. In his off time, he enjoys the great Northern Michigan outdoors and spending time there with his family.